Adware is the most common malicious program you will encounter while browsing the web. Kavapuller Ads is one of the more recent adware programs you can get while downloading software from unknown sources. We recommend removing it, because this program was created to generate advertising revenue by subjecting users to numerous commercial advertisements that we found to be unreliable. There is no way to determine which advertisements are legitimate and which are not. Therefore, users ought to delete Kavapuller Ads as soon as they notice its presence on their computers, because this program can promote other adware, potentially unwanted programs, and so on. Please continue reading to find out more about our findings. 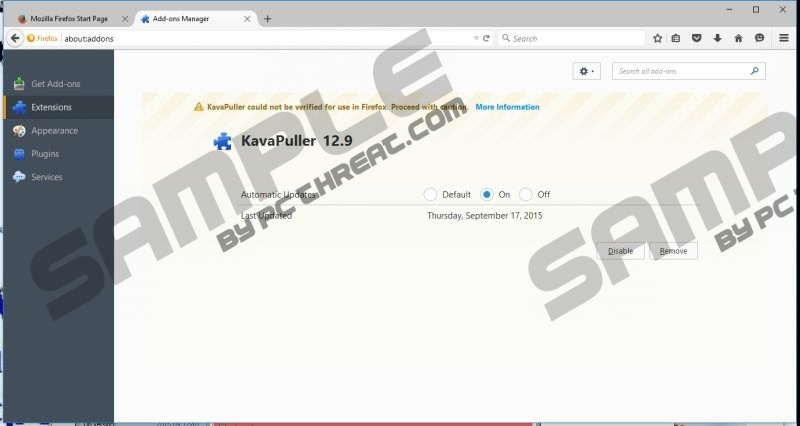 Kavapuller Ads is the brainchild of an adware developer known as JustplugIt Ltd. This company is relentless in its pursuit to make more money. Therefore, it is apt to make business arrangements with unreliable advertisers and other third parties. Kavapuller is likely to use the pay-per-click system which requires users to click the ad in order for the developers to get paid, because simply showing the advertisements is not enough these days. Due to this development in the online advertising business, adware developers make their programs to collect non-personal information in order to tailor the ads for a particular user, thus potentially making them more appealing. The ads Kavapuller Ads displays may come in the form of coupons, banners, pop-ups, pop-unders, in-line texts, search related ads, and so on. Users may be subjected to several times at once. However, they do not appear randomly on every page. Most of them are generated while visiting an online shopping website. Not only is this program useless, but it can also subject you to unreliable content, such as suspicious software promotions, fake program updates, shady online shopping websites, and so on. Nevertheless, some ads are genuine, but mixing legitimate and non-legitimate ads only make it harder to see Kavapuller Ads for what it is. We have found that Kavapuller Ads is part of the so-called Multiplug adware family. Therefore, it has dozens of similar programs that might still be active even to this day. TrimModule and BocaEdit are just a few examples that belong to this adware family. However, this particular application is unique because it is a collaboration between Multiplug and JustPlugIt. So, this program is more similar to ExportApplicati, NiceAndFun, and so on. As far as this program’s distribution methods go it must be said that it is mostly bundled with malicious installers such as Vittalia or InstallRex. These installers often contain several unreliable programs and they are featured on torrent websites as well as some websites that distribute pirated material. It is plain to see that Kavapuller is useless programs that can only bring you trouble. As always, adware applications are unreliable, because they promote questionable content. This particular program is no exception as our research has found that it can promote illegitimate software. On top of that, this adware can gather information about you in order to tailor advertisements and make more money for its developers and their clients. So, once again, we suggest that you remove Kavapuller Ads. Locate the undesirable adware and click the Uninstall button. Locate the application and click the Remove button. Launch the browser and press Ctrl+Shift+A. Find the add-on and click Remove. Launch the browser and press Alt+T. Select Manage Add-ons, click Toolbars and Extensions. Launch the browser and press Alt+F. Quick & tested solution for Kavapuller Ads removal.